Before you complete the 12 missions with Martha (I got this quest line after 8 missions - Quest number 9 - Cooped Up), Izadora will give you these new 6 missions. Final reward is this Hot tub. 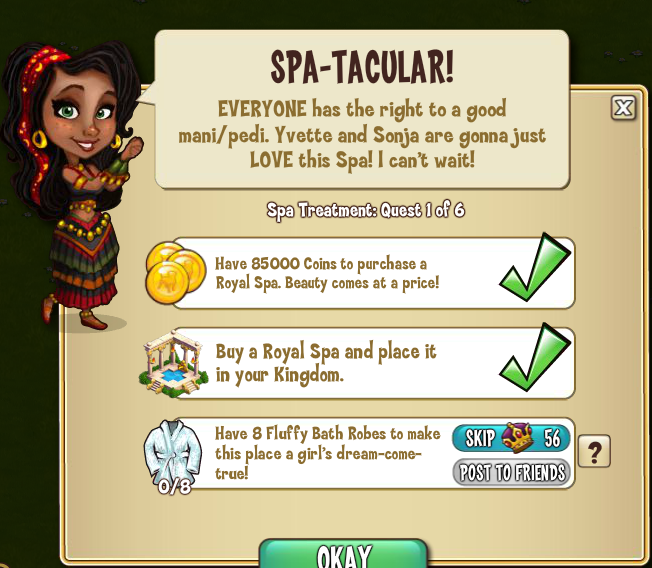 Have 85,000 Coins to purchase a Royal Spa. Beauty comes at a price! Buy a Royal Spa and place it in your Kingdom. Have 8 Fluffy Bath Robes to make this place a girl’s dream-come-true! Chop 5 Trees to help Rafael build up a nice musk for the ladies. Tend 10 flowers and grass in your Kingdom to find Izadora’s ribbon. Mine Rocks 10 times to see if the ribbon got wedged under one of them. Chop 10 Trees to see if any ribbons fall from the branches. Have 5 Peacock Feathers to draw an image of Izzy’s ribbon on the poster. Have 5 spools of Cotton Thread to weave a new ribbon (Crafted => Studio). Have 6 Bottles of Emerald Dye to make Izzy’s ribbon as FABULOUS as she is. Collect from 15 Buildings in your Kingdom to spread the word of Izzy’s new hair piece! have finished Marthas missions off and still dont have these? any idea on a time frame for release?? ?